Uh-oh! Booker and Elizabeth had better watch out! A cacophany of skill and supersonic powers make Melissa Gold the high-pitched hero, Songbird. Rustin has admitted that he has trouble grasping the concept of this character, so let's see if we can't come up with a super simplified version of her her origin tht might help: "Avengers villain decided she liked being good more." That about covers it. As you may be able to guess via the heel-face-turn angle, Songbird was a member of the Thunderbolts - the first version, with the Masters of Evil undercover. Her villainous identity had been "Screaming Mimi," and before that, she was a wrestler whose gimmick was a loud, piercing cry from ringside. So Daffney, basically. But the promotion she worked for refused to pay the women as much as the men, so a group of them started pulling crimes for Roxxon on the side. So it's an interesting story, but still: "Avengers villain decided she liked being good more" is easier to remember. At a glance, Songbird looks a lot like Rogue: her hair is white with darker streaks in the front, rather than dark with white streaks. Different! In her case, the color is a dark pink, nothing natural, and it hangs flatly rather than billowing off her scalp like a thick, puffy cloud. As Screaming Mimi, she wore a spiky wig, and painted her face like a clown - none of which carried over to her heroic identity. The costume this toy is wearing is not her original: this is a toned-down version she adopted later, because the first was so '90s-tastic. The broad strokes are the same - a dark blue suit with white shapes on the chest and legs, and golden armor on the shoulders, belt and forearms. The patterns are probably meant to look like feathers, which means there are definite similarities to Phoenix's costume, as well. The belt and shoulder pads are separate pieces fit over smaller medium body, while the forearms are new. The armor gets in the way of the shoulder joints to an extent, so don't expect Mel to be throwing her hands up triumphantly any time soon. Also, since her hair is hanging down over her shoulders, that means the head won't move around a lot, either. 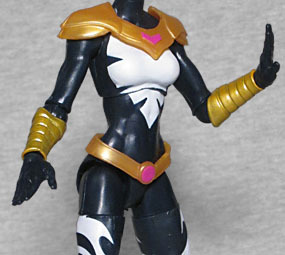 She may dress like Phoenix, but Songbird gets something neither Phoenix figure did: her wings. Screaming Mimi's powers were just sonic screams, like Banshee or Black Canary, but Baron Zemo gave her an upgrade when she joined the Thunderbolts, so now she can create solid shapes like Klaw does. 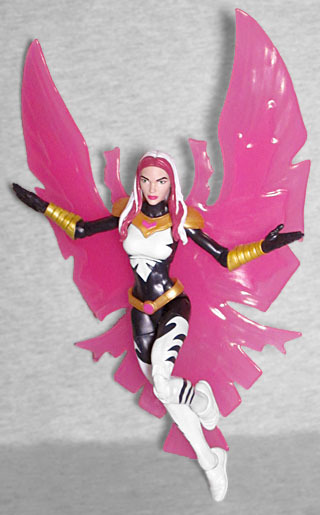 To that end, the figure comes with a big translucent magenta piece that represents the sound-construct she uses to fly. It's about 8¼" tall, and features a peg so it can plug into her back. The toy's hair gets in the way of a proper fit, so make sure you tuck the upper edge of the accessory under her hair, rather than just trying to push it straight into her back. It sits a lot better that way. The wings don't lift her off the ground at all, so she'll still be standing around with them, but it's better to get an imperfect accessory like this than to not get one at all. As a part of the first Infinity War series, Songbird comes with a piece of the Thanos BAF. The right arm. The one without an Infinity Gauntlet on it. It's purple, so it looks like she mutilated The Grimace. There's a real shortage of Thunderbolts characters as toys - the classic team, at least. There's Moonstone in the SDCC set, and then pretty much no one else. Songbird has had the most successful super-career going on, so it makes sense she'd get a toy, but we really need a Citizen V, Techno, MACH-1, and Atlas to go along with this Avengers villain who decided she liked being good more.